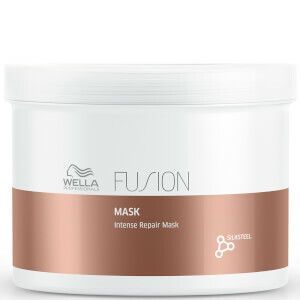 Introduce hair to the innovative Fusion Care collection with the Wella Professionals FUSION Mask; a luxurious, creamy mask that targets damaged hair in need of nurture. Simply apply to damp locks and let the hair mask restore health in just five minutes. 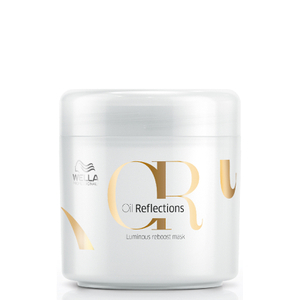 The rich treatment boasts Wella’s ‘Silksteel Fusion’ programme, which utilises Silk Amino Acids to repair and protect hair against breakage and damage. Inspired by resilient spider silk, one of the strongest fibers in nature, the mask seeks to restore strength to locks by penetrating deep into each strand. The FUSION mask leaves locks conditioned, smooth and resilient. Hair is visibly healthy and renewed. Påføres i fuktig hår. La virke i fem minutter og skyll grundig.